Protests are happening at the Majlis A Shura opposite the airport right now. Avoid if possible. As covered in the Muscat Daily, and by Dhofari Gucci of protests in both Salalah and Sohar. There has also been reports of protests in Sur, but I've not come across anything supporting this yet. Yesterday, the ROP used tear gas to disperse the crowds at the Globe roundabout in Sohar (next to LuLu supermarket). HM Sultan Qaboos has announced this evening : That the Majlis A Shura will have greater powers, The State Audit Institution will have it's role increased, 50,000 job opportunities are to be created by Government, and a monthly amount of RO 150 for registered job seekers with the Ministry of Manpower, the Public Prosecutor is to now be fully independent (Currently the PP reports to the head of the ROP), members from the Majlis will be appointed to State Audit to investigate how they can improve. Some members from the publicly elected Shura in the next session (election) will be selected to become Government ministers. Reports ranging from 1-4 people have died from "gunshot" wounds in Sohar. ROP (Royal Oman Police) have deployed tear gas and limited use of rubber bullets to try and disperse the crowds. The rubber bullets were deployed after protesters set fire to a gas truck near the ROP station. Protesters surrounded the ROP station in Sohar today to demand release of protesters arrested yesterday. New reports suggest the ROP station in Sohar and the Wali's house in Sohar have been burned down. Protesters are not calling for a regime change, just political reform, an increase in the minimum wage and more assistance with living costs. There have been reports of protests starting in Azaiba here in Muscat - but this has not been confirmed yet. There are reports of looting from the Lulu supermarket in Sohar. There is a small peaceful gathering outside the Majlis A Shura here in Muscat demanding that force not be used against the protesters in Sohar. Calls for protests here in Muscat and in Nizwa have been made for tomorrow, multiple locations mentioned in Muscat: The airport, Wizarat, Mawehlah. Expatriate staff working at the university are currently safe in their accommodation. 3 cars were burned in the attack against the Ministry of Manpower building in Sohar. Reuters, and all other major news outlets are now running with this story in Sohar. The best source of live up to date information is on Twitter with the hashtags: #oman and #sohar. I'll update this with relevant news when I can, please feel free to share anything relevant in the comments section. Protests continue in Sohar, with planned protests at the Sohar Port. 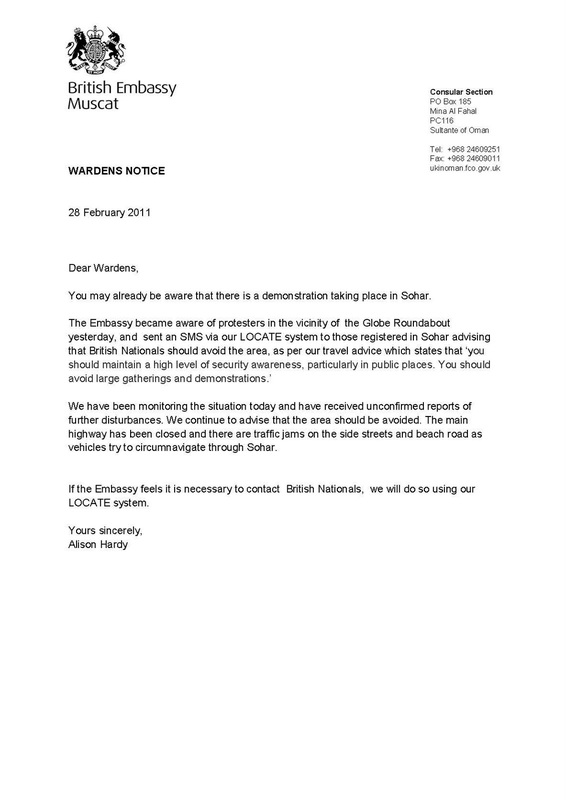 The British Embassy issued a notice, posted below. but whats the reason for protest?? Come on Oman - rise above this - we are too good to protest! Think about everything good HM has done!! we are waiting bad days for Oman like as the others?? There are forum posts about this moving to Muscat tomorrow afternoon and to Nizwa around the same time. Let's hope that the ROP continues to be very circumspect in its handling of the situation. In Bahrain protesters started out saying they just wanted reform, but when they were met with violence the s#@t hit the fan... and now they want regime change! I wish I could. An Omani colleague of mine read on a blog that locals are urged to gather in front of the Airport area today or tomorrow afternoon. But now someone else is saying that the protests will be organized to show support for HM and to oppose the demonstrations in Sohar. "Everyone should support FREEDOM, enough of dictatorship..... "
You obviously have NO idea what you're talking about Anonymous! Try living in a so-called 'democracy' and see how badly that runs. Crime, violence, rapes, murders, people getting away literally with murder. Don't condemn this system, it WORKS! I have to agree with the Anon above! Inshallah people will be ok. Inshallah. I think unemployment, lack of social welfare system to help the poor and the unemployed, no equal opportunity for those without wasta and the land grab by a minority leaving Omanis unable to buy homes - are all contributing factors. The whispers of disgruntle have been there for years but oppression by the system and a go to jail card for anyone opposing the status quo have now made people throw caution to the wind. Lets be honest only a minority have benefitted from the new Oman albeit the Yes Sir brigade who were not originally from Oman but brought there to support the system. So why is anyone surprised that the majority want their rights too. Fair request consireding plenty of oil revenue came in but never reached the streets or even touched the Omani life. Example - how about giving scholarship to higher education to people of working class or poor parents instead of big shots and wasta clad brigades. I agree! This system WORKS! Democracy ... don't get me started. Aristotle said it all, democracy is the WORST form of government. Guess which one is the best? MONARCHY! The problem is not with the government here, it is with the PEOPLE. If Omanis were MORE interested in their own education, then they would have jobs that pay very well. It's that simple! I teach here, I know what I am talking about. 85% of students come to colleges and university ONLY to get their monthly stipend, not to learn anything. The other 15%? They get the GOOD JOBS. If more Omanis cared to educate themselves, then more of Omanis would have the jobs that expats have, and would be earning excellent wages! What, do Omanis think that in a democracy you can do NOTHING and just get money from the government??? Why? How much you work, learn, invest in yourself - that's how much you get in return! Duh! I only WISH I could have been born in a country that, instead of making me pay thousands of dollars to go to university, would actually PAY ME to go to school! Shame on you, Oman! You should be grateful. I'm sorry, have to add - just saw the Anon post above. You say "no equal opportunity for those without wasta" - do you think Oman and Arabs are the only society to have wasta? Everyone does! We just call it "networking". It is because of networking (read: wasta) that I cannot get an equally high-paying job in my country! I do not have the "network", while some of my more wealthy compatriots do. It is a fact of life - human beings are corrupt, or, at least, easily led to corruption. You want perfect and complete justice? We'll ALL get it, but not in this world. Also, we, expats, are not here to support the system that abuses Omanis. We are here because the majority of Omanis are not capable of implementing and maintaining the system. There's a huge difference. This should be what you must aim to change - I'm all for that! I think dear teacher you should the article again - they are not asking for change of leader but the basic rights that all citizens in the Western world have - the right to live a decent life and a better future for their kids. At the moment it is all in the hands of a few - why. I am not surprise they dont want to get educated when they have patronising individual like you teaching them - shame on our system for failing their people in that area. Lets see mm - the west got rid of money draining monarchies along time ago and have enjoyed freedom of speach, thought, feelings etc etc and here giving lectures to those who never had it yet they couldnt stand the same system and fought against it. Very rich. Dont Omanis here get free education and health, western countries dont have something called westernization, like there si omanization here, reserving their right to a job. If the locals are so interested in working hard, why dont we see any local cleaners on the roads? There are Omanis who go to bed hungry; of course, they desperately need to be heard. Unfortunately many Omani's with influence are a product of the Peter Principle (promoted or put into a position beyond their level of competence). To save face they succumb to pressure... and the rest (wasta) is history. Don't get me wrong, there are many Omani's who are really great at their jobs but the reputation/credibility of those who haven't a clue how to neither manage nor lead give the general feeling that cronyism is widespread and ok - until there is change in attitude, don't expect anything to change - it's up to you all Omani's, drive your future, don't take a back seat to incompetence at higher levels but don't lower your standards to what was demonstrated at Sohar today with the violence. well my dear expat and much educated lady from her own imaginary world if you could open your eyes before teaching n judging others so you can see the omanis are real hardworking and welcoming the world to share their bread. the support shuld be there for omanis as its their country. I think if you read the article they matter is clear they want some right which every citizen all over the world expect from their country. With teacher like you with attitude problem it is no surprise no one want to learn - as your post is very patronising. Their parent were uneducated and therefore cannot get jobs so dependant on kids to bring in the bread and butter - so what do you expect from them. West only changed after WW2 but before that it was no different. Wherever you go, today, you got to put yourself in the position to make a good living! This applies to US, CIS, Europe, Far East, Australia and ... Middle East! Come on, Omanis! Don't tell me you are not put in the position to earn a good living. If you do it, don't even dream about doing that somewhere else: you would get poorer than now in Russia, Spain, US, ... Everywhere! Dear Anon, the one from way above - I know they are not asking for a change of leader. I was responding to the comment above about "ending the dictatorship" and calling for freedom. That is just plain silly. And thanks for patronizing me by calling me a patronizing individual. You don't know me, or how I do my job. I really like my job, and I really like Oman. Believe what you will, but know that if I was after the money and without morals or professional ethics, I would be working elsewhere in the Gulf. But I'm not. What was patronizing about what I said? You are talking about having the right of speech, so here I am, exercising it. I am not making the rules here, nor am I placing my judgment on Omanis and trying to be patronizing - I am simply saying what I see, every day in the classroom. It makes me sad. And I can do NOTHING that I want that is good and positive and uplifting to change this type of education system. I try, again and again, and there are those that I reach. But they are few, unfortunately. Is this MY fault? How, pray tell? I am not allowed to speak to my students of so many things, that elsewhere might have a different and more uplifting message and reach them - but still I try. However, what does my trying accomplish if the students are not willing to try themselves? Are all of us, foreign teachers in Oman, bad teachers? Bad people? Patronizing sods? That is a very hateful thing to suggest. Ultimately, my question was (and is) - is it the education system (higher education, that is) that needs to change, or is it the very approach toward education by Omanis that needs to change? I think you are right - shame on the system, but not for employing us as teachers. Shame on the system for preventing us to do our job! Since I am a foreigner and you may be destined to take everything I say that is critical as a sign of my own bad attitude - look up Dhofari Gucci, read one of her more recent posts. She is Omani, she is writing about her own society - maybe that way it is easier for you to accept criticism (which I actually meant to be constructive). With respect to the western system and our "freedom" let me give you my perspective. I did not, myself, fight for "freedom" of any kind, that was before my time. And I am certain we and those before us did NOT succeed. Sure, we "can" blab and think we are all free and important, but where it COUNTS, we have no rights whatsoever! The "freedom" you say we fought for and have, it is an illusion! The mainstream media worldwide is controlled, it is censored, it is BOUGHT by the rich and those they hold in power. President Obama, for example, is most certainly not an example of the first black president. Why? He is president because his mother is the WHITE, rich, well-connected lady from an important family. He is, not literally of course, more "white" (where it matters) than most white people! And yet, we are "sold" on the great story of the glory of democracy. After all, we needed to prove it worked after Bush, didn't we? I dislike hypocrisy - and this is what the west has become. They lie, play games, manipulate media all over the world, and use people's struggles to achieve their own ends - which are always in their own interests, and not in any way for the people. At least here, in Oman, you know what is what! You know there is a power over you that controls you, you may resent it, but at least it is real. In the west they keep us in an illusion of freedom and our own individual greatness. They do this so well, that we believe the lie, and many of us do not think to look twice - and see what is actually going on behind our backs. And, unfortunately, it is exactly the same as what goes on here. It is a horrible reality. We live in a world of extremes - here, for example, some complain that not enough women are given the chance to work. They may call upon the "great" west and envy our women being able to work. Only, the thing is, we (western women) are not ABLE to work, we now MUST work! The whole system, after our female fight for freedom, is now based on a TWO-income family! The prices for everything rely on most middle-class average husband-wife families to have to have BOTH the husband and the wife working! And what now? Where is my much celebrated freedom? What if I want to stay at home and be a devoted mother? I CAN'T do it. Is this the freedom that my mother, grandmother, great-grandmother fought for? That I cannot be with my child, breastfeed it, etc., for more than a few months? Because I cannot afford it? And so, here I am, in Oman, trying to earn my freedom. Yes, I am earning money, but did you ever think that some of us have no other choice? Why do you think we are so different? I really don't understand that. What I am trying to say is that if you stop and really think, you will see that what we would all - Omanis, Americans, Japanese - like is utopia, and that it doesn't exist. Also, don't forget the outcome of Egypt's last revolution 32 years ago. Two years later they elected Mubarak, and look where that got them. Change all of the people in the government of Oman, and they will become corrupted sooner or later as well - they will have tribal pressure, etc. Wasta will live again. The ONLY thing you, or me, or anyone of us CAN change is our own selves. We should remember that - that is where the true revolution takes place. All else is only a bad play. I wish you all only the very best - may you get all that you want and more. I truly oppose the protest... violence & destruction are not the methods to protest. Dear Anon - I know they are not asking for a change of leader. I was responding to the comment above about "ending the dictatorship" and calling for freedom. That is just plain silly. I'll apologize, for I now see that I have offended by my earlier posts. This was not my intent. It was simply to point out that the power is literally in your hands - but not through violence. It is yours - though education. great looks like sohar will get what they want alhamduallah.... but whats about muscat and other citizen around oman are they are not countable....???? well nathing to say but all i we mean is dose its requierd few injureed n death to get their right in shadow of this geart leader...??? oka in the end i'll pray for the best for all inshallah.. I think the salary need to be increased for the lowly paid citizens and finding out the corrupt officers in government and other authorities will solve the issues in a days time. All my Omani friends are of the same opinion and no one supports violence. These looters are the corrupt people and if they given the chnace to be a minister they wil do it on higher profile.and this is what spoiling the image and humanity of Omanis and other citizen. as i know individuals experiencing for the past years running with all documentation and sucess to get financial assitence from banks, and even to Sharkah which meant for funds for youths.they have all praises and promises but no actions. i know many many cases where simple people suffer and people with millions will make use of these kind of funds and get success and expand. When a common omani success without having a family back ground of minister or public figure that is the time we omanis will know laws and regulations are justified in oman.if the support is given for such individual or SME's to grow then these are the places where our young omanis can start thier career and grow and make thier life and families secure. finally we all know all our brother survive thier life with burden of loans ( housing,perosnal, car, marriage etc. )the amount of intrest bank charges is minimum 8% and above and we spend more than half of our life clearing all this. present scenario with bank that they dont give out the loans unless thier criteria is not met. issue like company listing in banks, minimum salary elgibility, employment tenure all this made very difficult where a commmon man really suffers in his daily life.which menas 200 |RO wil not mean anytihng to a common man, majority of them having not only wife and kids but a extended famaily to look after. These are some of my views of common mans life in oman. We all know what our great leader His majesty has done for oman over the years and we have great respect and love for him. unfortunately the medium between citizen and His majesty is not functioning as it should be. so we want to pass our humble messgae to our great leader as we know he is very kind and stand for his subjects.we wish him good health, peace and prosparity. to conclude i request omanis not to be violent as one who suffers is our won brothers, wether its securtity, civil service or any other forces. at the end of the day its our own brothers...we shouldnt forget that we are asking for our better future and WE ARE NOT FIGHTING FOR FREEDOM and ITS NOT A WAR WITH OTHER COUNRTY.lets not make people of the world to speak about us and make use of our sitauations and post comments of our own sultanate and our ruler comparing other corrupt leaders and countries around the world.. Sometimes the birth of a truly democractic nation is truamatic. Whether you are under the rule of a despot or a benevolant dictator, you are STILL under the rule of a dictator. You have no say in where your country goes. You have no way of protest. In democracies, a person can demonstrate and disagree - moreover ythat right is protected by law. In dictatorships, good or bad, you are not. I fervently hope that Oman does not degenerate into the violence seen in Libya but equally, I fervently hope that the Omani people gain freedom to have a full say in their own country. Gone are the days when the people in power should be there because of their birthright. Gone are the days when who you know should be the only criteria for high office. We all live in the 21st century. All of us, everywhere, should have a say in how we live our lives and, moreso, how the country we live in is managed. The Sultan is a wise man; a benevolant man. I am sure he will read the will of his people and give them what they desire and what would be his most generous gift of all - true democracy. I completely support the protests I think its time for changes to be happening in Oman. Unemployment rate is high, salaries are low, some people actually go to bed hungry. Plus there is a lot of corruption in the government. And for those people who oppose the protests they obviously did not have to go thru any of the things these Omani citizens had to go thru so basically you have no say in this. Exactly Desertman and well said. The people who oppose these protests are those who have been living the comfortable life and they are the minority. They have no clue to how a majority live and nor do they care as long as they are okay and yes know plenty who go to bed hungry. Let us be honest here only the minority have benefitted in Oman since the 80's and most of them are not Omani's but became Omani's even some of those called prominent families. When people are hungry and have no future and all they can see is hopelessness what do you expect from them. They have been oppressed for so long with no one to hear their cries or care - so how did you expect them to react. Peopleare entitled to a voice but using force to silence them will only aggrevate the situation more. We all knew this moment would come one day and that one day is now and it is about time. Oman is NOT Tunisia it is NOT Libya and should not be compared to them or even other countries in the region. The issues here are different and should be approached differently. Violence and aggressive behavior should not be acceptable. HM has shown he is listening and respect is given to those who equally show respect. Let it also be said that in countries of democratic freedoms there are people and citizens who work in ALL aspects of the work force. That means that you may be a plumber a construction worker. Not fancy by any means and are people here who would work in these jobs. Are people ready to understand also that you need to prove yourself and work your way up the ranks of a company to show their ability and worth. I support the PEACEFUL demonstrations and agree with much they are saying. However the youth here have to understand that there are many people in many other countries who have gone to school and instead of being an engineer are working as a waiter/waitress as there are also a shortage of jobs worldwide. Competition is fierce and jobs are not just handed to you. You can not turn a job down because the hours are not to your liking or the position is not high enough. You certainly then can not complain that you can't get a job. Oman is a young country and people should realize that you can not over night change everything. Be patient, speak peacefully and be grateful of what you have. There are people in the world who would give everything and anything to have just a bit of what you do. 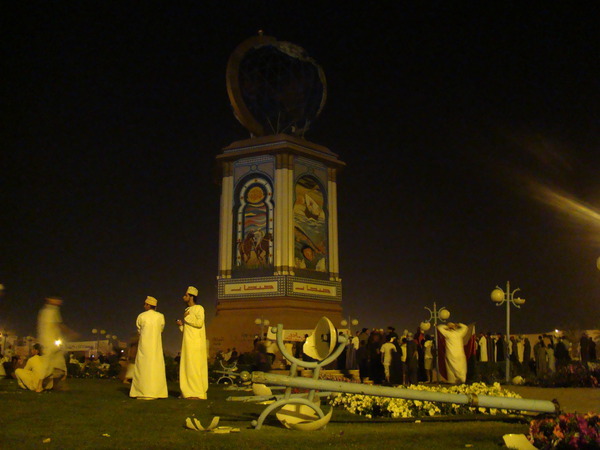 It should never have turned violent in Sohar. They went about the matter with much more integrity in Salalah. Burning down ROP buildings and cars hardly gets the right message across. It is obvious that much of the crowd is simply mimicking the events that have occurred in Bahrain and Egypt. I must stress that the magnitude is much smaller and their demands are absolutely different from those of other nations-but they have seen these acts take place to achieve results and are trying to do the same now. I am glad that HM has sent Sayyid Ali bin Hamoud al Busaidi, Minister of the Diwan of the Royal Court to move to Sohar to meet the protesters and listen to their demands, as one of my Omani friends has rightfully pointed out "the people just want to be heard and talked to". Any way, it's alarming that Oman is also caught up in the middle east fever. Let's hope things would settle down peacefully. There are a lot of expatriate community who must be in the state of shock. I just hope things stabilise fast. The youths are misguided - there concerns may be valid, but rioting is no way to proceed. I have no pity for the rioters. For those romancing the idea of establishing a democracy, I ask, what is the need to destory a system that works. Most democracies that I know of have many times more flaws and shortcomings than the system here. No one should trivialise and squander the achievements of this nation through rioting and vandalism. 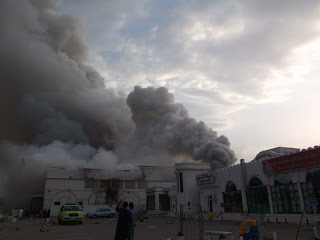 -It appears that the Lulu Hypermarket near the Globe roundabout has been burnt down by protestors. Alongside numerous vehicles, the house of the governor, the police station and other properties. Ya, because nothing says "peaceful change" like a bonfire. As of now, the Lulu Hypermarket in Muscat has been shut down since yesterday evening. This incident should open eyes of all ministers and higher officers, last few years people were suffered a lot bcs of increasing living cost and low salary. Minority people are enjoying too much. First should try to reduce the gap of this financial status. poor people bocome more poor and rich people bocome richest. It appears that there is a traffic jam from CCC to CBD area due to the large number of people trying to get to the Ministry of Manpower to register with them in order to be eligible for the state grant of 150OMR. No one is saying that things are perfect. Far from it. Even those that "oppose" the violent protests, like myself. Trust me, it is not because I am living a cushy life that I say this - it is because I have lived through a war, as well as violent demonstrations that took place again and again, complete with tear gas, bullets, police beating all and any they can get their hands on (including women and children - I saw a child, a little girl, beaten with a police baton in front of my eyes, just for being there, her arms and ribs broken). What was the outcome? We thought we were getting a democracy. Instead, we got corruption like you wouldn't believe, an inflation rate that keeps getting worse and worse, unemployment that has quadrupled in the last 2 years, and officials who claim we are on the right path! All that I have learned tells me that violence is an excellent way to have innocent people die - and their number does not matter. Nothing more. As of yesterday, there are at least two less young Omanis than there were yesterday. And why? Why would Omanis resort to violence? I can understand your demands - but so does your Sultan! He has been listening, making changes, bit by bit. There are new decrees coming out constantly. All this you achieved by peaceful protests - why stoop to violence, looting, stealing, etc.? By all means, continue protesting, peacefully, until you get all that you want and need. The violence is not acceptable. Maybe it is needed elsewhere, but here, in Oman, you truly have a great leader - and he listens to you! Also, try to think ahead, to the future, to how you can keep these changes that you will bring around. How you can make it even better! Violence is not the answer - the answer is to look at the cause of the problems to begin with, and, once you have changed some things, to change those things that cause corruption, poverty, etc, in the first place. I still don't understand what is patronizing about these remarks, why it is difficult to understand that if a person who has the flu changes his clothes, it doesn't mean that they got rid of the flu!? I would like nothing more than to see you, Omanis, change your lives for the better, but, and here I will repeat myself, this is ultimately up to you. You should look towards bettering your society, first and foremost. Get rid of the things that allow for corruption to take place. Not look to violence. Also, keep in mind that change, betterment, it all takes time. Yes, there are problems, there are those who are hungry - but this is so in every country in the world, not just Oman. Look where Oman was 40 years ago, look at it today. The changes are enormous, especially for such a short time span. It took most other countries 400 and more years to develop in the way Oman has in only 40. This is a stunning achievement. Protest peacefully, but work on bettering yourselves even after these protests are just a memory - I am sure that the development you bring about in this way will dazzle the world in the future, as much as the development so far has done. But that is the only way you will achieve anything long-term - protest in themselves will yield very little in the long run. Is protest planned for tommorow confirmed ? Will the offices and schools be given a holiday? Will the roads be blocked ? Dear Anonymous. I have pictures on my blog confirming the burned down Lulu. Please feel free to visit to reconfirm. In regards to the traffic in Ruwi, I had two friends who were stuck there trying to get back to work and they saw the gatherings at the ministry of manpower in CBD area. I wouldn't actually write these things if they werent facts. Things are scary enough as they are at the moment. This is a sad sad time for Oman - a country with such a wonderful heritage and a great future ruled by one of the few men in the world who actually listens to his people, and now being threatened by a few misguided "thugs" who don't appreciate what they have. This is just plain stupid. What do people think that "democracy" is some kind of magic wand and all of a sudden you're going to be educated and "feel" free? Additionally, the people here in Oman enjoy a good standard of living and many people envy the comfort and stability of Oman. Part of the reason why people in Tunisia and Egypt rebelled because they see how people in Oman live and wonder "why can't we have the same?". This is truly a sad day but it is similar to the hadith of the Prophet Muhammed (pbuh) when he mentioned “If the son of Adam had two valleys full of wealth, he would not be satisfied until he had a third. Nothing fills the belly of the son of Adam except dust..."
People are simply ingrates and anyone looting and causing chaos in Oman is a disgrace. Oman amongst the GCC countries has the most poor citizens and because of corrupt government officials, they are not getting their rights fulfilled, which seems to be very basic from what they have demanded. Put the shoes in your foot and feel that there are people in oman who are without food. The government should have acted way before to cure this current mishap. All the GCC countries are benefiting from crude oil, then why should people from Oman suffer?..I am not an omani citizen, but i still feel the protest should happen, but peacefully without hurting anyone. The motive is to prove a point towards the government...now if they listen or not its up to them...Its about time that the arab people should stand for their rights and overthrow the corrupt government if necessary. Well Mohammed,I am not sure as what is you point,but this is not the time to do the protest,this should have happend before. When there is a chaos all over middle east for freedom and democracy,if Oman joins the wave of protest and violence,will only lead to a global view that the condition is the same like in egypt and libya and bahrain - but the reality is only for a salary raise and more job oppurtunity. I would strongly suggest and request to all citizens to give some time to the government to rectify and plan this well and come out with a logical solution but fighting and putting pressure on the govermment by breaking,burning and looting is not the way. Oman has the least oil by far. Why wouldn't they have the poorest citizens. I HOPE UAE DOES NOT FOLLOW AND PUT LOT OF EXPATS INTO TROUBLE!!!!!! Be careful what you wish for Oman. There are many democratic countries elsewhere in the world which are in the same situation as you with regards to unemployment, low pay and corruption. Take a look at the UK, the people voted for that government and almost everything that the politicians pledged to the people has not been delivered. Add to this an increase in tuition fees, higher fuel and taxes. And even though there were protests, the government didnt listen. At least the sultan is vowing to make changes. Just because a country says they are a "democracy" doesn’t always mean you will get what you want. The Omani system works and at least you have a Sultan who is vowing to make changes. I am from Great democracy, INDIA. Corruptions are in very very high. Living standards ?? ?, If you are comparing with Oman, India is having great wealth, no need to go anywhere everything sufficiently available inside India. We love Oman very very much. all are provided by (or trying to)the leader. Dear Omani's love your country support your leader. Otherwise everything will be collapsed. regaining will be easy for the countries like India, etc. for Oman it will be very tough bcos this is the best time to come forward for Oman. For all who are against the protests, and specially expats! Stop talking about us Omanis as you know it all. We love Qaboos so much and the protests are to stop corruption. Omanis before the 1970s had to immigrate to other gulf countries and worked as servants, and now you'd come and say we are lazy and we choose job, be fair!! And for the Indian fellow, you can't compare india to oman! Our population is less than 3 million and we are a rich country! So is it unfair to ask for just and fair treatment for us and our children. Newly graduate from the US and Uk come home and remained unemployed?do you think they don't want to work, or the ones who graduate from squ, do u think they like sitting at home!!!! Go to the poor areas in oman, speak to the locals and then judge!!!!!! We love his majesty , support him,, and we want changes made to the better!!!! I returned to Oman from the UAE (via the Hatta border) and came through Shinas roundabout at exactly 12noon today (monday). I really had to ring around when I was in the UAE to see if I could make it back safe with my wife and two toddlers in the car. We were very concerned, but HAD to get back to Muscat ASAP, so we made the decision to proceed. 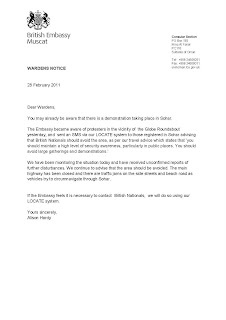 Speaking to a car dealership representative in Sohar, he suggested I get to the Safeer well before the Globe, and hook left at that roundabout, run parallel to the highway and get back on just before the Sohar gate. As we entered Shinas, the roundabout was on fire - tyres in a pile being burnt in two spots. What we were not prepared for was the roundabout before the Safeer! The road leading to the port was blocked, and all entry and exits into the R/A were blocked by trucks (with bricks chocking their tyres). There were at least 500 people, most wearing balaclavas and head scarfs shielding their faces/identities. It was extremely frightening. They tried to stop us, and we ploughed through. I managed to squeeze past a hilux that was blocking the entry, and drove straight up to a truck blocking our exit. I mounted the curb to exit the roundabout on the sidewalk, heading towards muscat. There was ABSOLUTELY NO police presence ANYWHERE! We got to the Safeer, hooked into the inside road, and Military were everywhere - especially in front of the ministry buildings behind the university. All of the petrol stations were closing, but we managed to refuel with a black-smoke-belching Lulu in the near distance. Once we made it onto the highway (near the Sohar gate) at approximately 1:30pm we saw at least 50 armoured vehicles traveling from Muscat towards Sohar. No police, just military. Fire trucks, water trucks - water canons? big guns and about 20 buses with riot police. Then what looked like a delegation and more armoured vehicles. It was endless. We made it back, but their seem to be so many conflicting reports. Some saying stone throwing at expats etc.. All we had was what I described above. We are clearly expats, and we were not attacked. We were, however, very very scared trying to get through to Muscat. There is a serious military presence at the Hatta border. I just read Shy Rebellious Arab Girl's blog, in which she gets all titilated that she was given RO 1000 today - as she is an SQU student. That's great. What a way to placate unrest. "Are you angry? Oh dear, here, take a bunch of money and go sit down over there. There there." LONDON, Feb 28 (Reuters) - When Saudi King Abdullah arrived home last week, he came bearing gifts: handouts worth $37 billion, apparently intended to placate Saudis of modest means and insulate the world's biggest oil exporter from the wave of protest sweeping the Arab world. But some of the biggest handouts over the past two decades have gone to his own extended family, according to unpublished American diplomatic cables dating back to 1996. The cables, obtained by WikiLeaks and reviewed by Reuters, provide remarkable insight into how much the vast royal welfare program has cost the country -- not just financially but in terms of undermining social cohesion. Besides the huge monthly stipends that every Saudi royal receives, the cables detail various money-making schemes some royals have used to finance their lavish lifestyles over the years. Among them: siphoning off money from "off-budget" programmes controlled by senior princes, sponsoring expatriate workers who then pay a small monthly fee to their royal patron and, simply, "borrowing from the banks, and not paying them back." At least in the UK, people will have a chance to make changes peacefully and legally - watch the May elections and see the response to Cameron and Clegg in Scotland. That's what the Omani people are looking for. People who raided and burned LULU in Sohar have not only stolen goods like common criminals, they have stolen the jobs of all the Omanis who worked there. I agree with Johanna on the previous comment, shame on them all. All of Omanis including Sohar people are against the minority group of who vandalized public and private property. 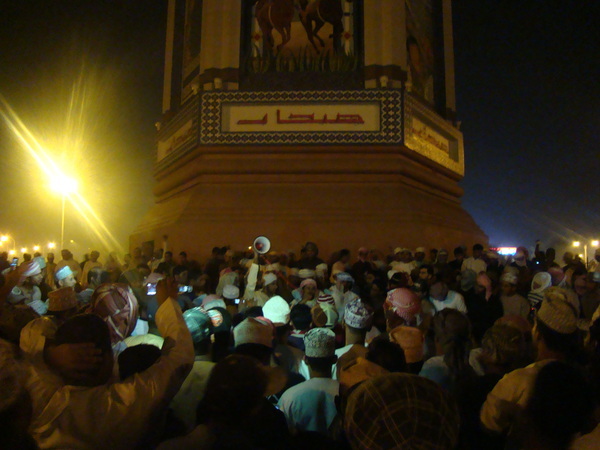 All of the protests happened peacefully with the exception of what happened in Sohar. I have to point out that Sohar people have formed groups to protect the assets and public properties after what happened immediately. it is confirmed that expats are stoned. I myself was lucky enough to escape from pepsi cans(not empty) thrown by a group of youngsters. Strong and wise leadership is the blessing of Oman. With the change you will be going back to 40 years. Democracy in countries like pakistan is not good for people. The starving people will become more starving. We're hearing nothing else... so have things calmed down? Any more updates? Has the Sultan given the speech everyone was expecting yesterday at 7pm? olga, you are treading on this ice here with your rumour mongering. i'd be careful if i were you. additionally, your identity is easily determined. just some friendly advice. Some of the protestors were shouting out some names of officers in Civil Defence and Ministry of Health who are supporting business in monopolising the Oman market. @Abu Qantab- how are they rumors if I clearly state my sources? Also, everything I have covered so far has been widely written about in the media both local and international. abu qantab - What is it without the very unveiled intimidation there? What she posted here was in no way harmful and as for rumor mongering - perhaps you've been ignoring the gossip, phone calls, blogs and messages flying around which are potentially a lot more damaging than a harmless and innocent enquiry. I agree with the above person. Ive been checking her blog for news, and its quite reliable. no one is trying to spread rumors here. she is trying to show concern and provide information-something that the media doesnt give enough of! there is no point in you threatening her and telling her she is walking on thin ice. I appreciate all the bloggers for their hard work. I'll also add - the "news" about HM addressing the nation of Oman was also posted on a blog run by an OMANI. What's with the threats Abu? She's not making stuff up and just asked a question. You, Abu, are the one on "thin" ice - it's not very manly of you to threaten a mere woman asking a simple question. If the speech is a rumor, then YOU give us the true news - that's what a man would do. I'd like to know who photoshopped the photo of the Majlis A'Shura. I work almost next door to it and drive past it at least six times a day. Today is March 1st. I drove past today as usual. I saw no indication of any smoke damage whatsoever, which would have been impossible not to see if such a fire had happened yesterday, the 28th. This is complete bullpucky to quote Rachel Maddow. he names of the corrupt officer in Ministry of Health is Mr.Ali AKA Dr.Ali ,some one from the higher authorities or ISS should visit his home and it is sure that they can understand where the money for Minsitry of Healt Project is vanishing.The office name in Civil Defence is Harib. lONG LIVE HM and OUR UNITY UNDER HIM. UNITED STATES HAS NOTHING TO COMMENT ABOUT US ,THE GREAT OMANIS.WHO ARE THEY TO COMMAND US .ALLAH WILL GIVE THEM AGAIN.OUR COUNTRY OUR LEADER.UNITED STATES CAUSING UNNECESSARY PRESSURE IN GULF BECAUSE THEY WANT TO STEAL EVERYTHING FROM US .THEY ARE BEGGARS AND CAUSE HAVOCS IN PEACEFUL COUNTRIES BY SENDING SOME ENEMIES PROTESTING AGAINST.DOWN DOWN UNITED STATES.LONG LIVE OMANIS AND OUR GREAT OMAN. DO NOT GET SEIZED BY THIS STUPID PROTEST WHICH IS AMERICAN PLAN TOWARDS DISRUPTION. Any update on the corrupt government employees ?